This is the best Banana for container growing period! 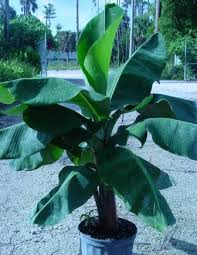 Banana “Poquito” tops out at 3’ making it just the right size to move, handle and grow in a pot. Large, bright green leaves speckled with red gives this “little bit of the tropics” plant a shot of additional interest. It is hardy down to 20 degrees but you can just bring it in when winter comes! We sell this in two gallon containers while supplies last.